We had 4 girls and 2 boys. The girls are Song, Streak, Fern, and Botyne Wink. The boys are Verve Rocks and Kerales Captain. Ken is a trial winner and regularly in the top 10 with limited trialing. He's good to his stock and handles aggressive stock with calm authority. He's been breeding well, producing pups that are thoughtful and easy to train with plenty of talent and stock confidence. Hips OFA Good, CEA DNA Normal (Optigen Accession #: 09-2363). Song stayed here at North Face Farm to be a sheepdog. She is a successful Open trial dog. 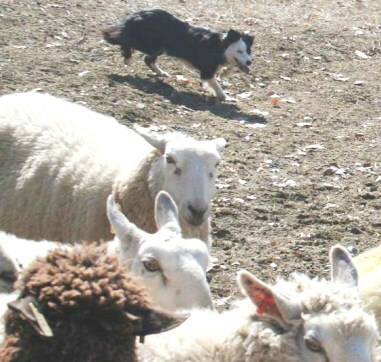 Streak went to MN to be a sheepdog. 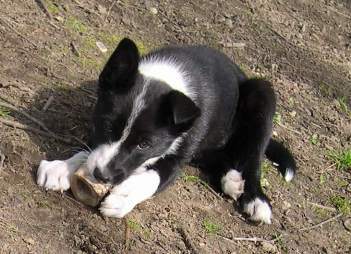 Fern is a sheepdog in NH. Wink went to Ontario to be a flyball dog. Wink got her Flyball Dog Excellent FDX Title her first time out in May 2009. 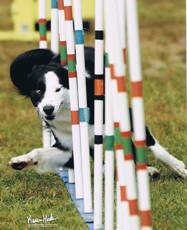 Verve is in MA, a successful agility dog. Verve has also been started on sheep and shows a great deal of talent. 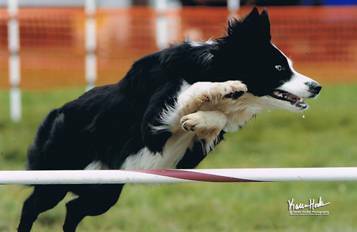 Catie had to make a decision between sheep and agility as she had a dog that was excellent in both and not the time to do both. Despite our best efforts to cement her addition to sheepdogging, Catie has decided to keep her focus on agility. Cap went to PA to be a sheepdog. He is currently running at the Ranch level.